Katie Lee (Johnson) Kazee was born on April 3, 1934, to the parentage of Robert Lockridge and Pauline Johnson in Marlin, Texas. She was raised by her maternal grandparents, Jack Johnson and Rosie Lee Johnson. Katie was the first of 15 children. After moving to Dallas, she attended school in the Dallas Independent School District. On June 3, 1951, she married her forever husband, Lueranze Kazee, Jr. (LJ), who preceded her in death on December 4, 2018. (That is 67 years of marriage!) To their union, four daughters were born: Anita, Debra, Jacqueline, and Juliana. Katie was a very dedicated wife, housewife, and mother. She always dreamed of being a writer. She loved to shop, she loved desserts, and she was a fierce domino player. Katie worked in the Kazee Family Fence Business with her husband as the bookkeeper. Spending time with her family was a priority. Katie was a faithful and devoted member of the Oak Cliff Church of Christ. She loved her church and minister very much. She headed different ministries and was a mentor for the young and older members there. Katie was also the founder of the Ladies Day program within the Dallas Metroplex while serving at the Trinity Park Church of Christ. 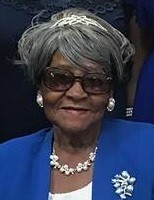 Having lived a long and blessed life for 84 years, Katie leaves many to cherish precious memories: four daughters: Anita, Debra, Jackie, and Julie; 11 grandchildren: Shaneka, Reginald, Valencia, Dameon, Michelle, Michael, Tondolyn, Sterling, Nikia, Kyla, and Leandria; 39 great-grandchildren; nine great-great-grandchildren. Katie had 15 siblings, 11 of which preceded her in death. She leaves four siblings: Robert Lockridge, Jr. (Mary), Charles Lockridge (Sandra), Anthony Lockridge, and Mildred Brown (Dana). Katie also leaves four sisters-in-law who all considered her as a sister: Mary, Lovie (Rodger), Rosie, and Ocie (Otis); one niece, Shirley; special cousins; and a host of other relatives and friends.